In the market for a new pinpoint metal detector? We compare the best models on the market and see which we prefer. If you’re looking for the best pinpointing metal detector and need to get the best possible value for money, you may not know where to begin. There are a lot of different options on the market today, and with so many different models out there, how do you choose which one is going to give you the performance you need? Every metal detector owner is looking to maximize their finds, but another key consideration is comfort and ease of use. Those who are new to metal detecting are often surprised by the aches and pains they experience after a full day of searching, so finding a machine which helps you to avoid all the bending, squatting and kneeling is essential. The answer is a metal detector pinpointer. It’ll help you to find targets much more rapidly. Although you don’t officially need one, if you want to maximize your fun and get bigger and better finds, a pin-pointer metal detector is going to make an enormous difference to your favourite pastime. You’ll save on time and effort and enjoy your hobby even more. Take a quick look at how the top models compare before reading about each in more detail. Here’s where we go into a bit more detail. Find out how these top pinpoint metal detectors perform and exactly what we think about each and why. This Garrett pinpointer metal detector is a classic and is a great choice for anyone whether they are new to metal detecting or an old hand at the hobby. The ‘AT’ in its name means ‘All Terrain’, meaning it can be used not just for metal detecting on land but also in the water too. In fact, it can be used in water as deep as 10 feet – ideal for treasure hunting in lakes, rivers, lakes and even in the ocean. If you find yourself caught in a rain storm or in a wood full of muddy puddles, you can use the Garrett Pro-Pointer without any worries thanks to its impressive resistance to water, giving those who tend to treasure hunt in wet environments peace of mind. Thanks to its water resistance, you won’t have any problems cleaning this handy device either. You can just pop it under a jet of water and it’ll be spotless in no time. You won’t need to worry about having to cover up its speaker-hole like in the old days! That’s going to prove extremely useful if you’re out sifting through soil or using your device in muddy puddles. This model has earned the nickname "The Garrett Carrot" thanks to its luminous orange color. While this may put you off at first, you’ll find it an added advantage if you’re using it underwater as it’ll be much easier to see. You’re certainly going to find it much harder to lose your device! There are three different sensitivity modes to choose from with this device – high, medium or low, so finding small targets at a greater depth will be much quicker and easier. One further advantage is the retuning feature which enables you to shrink down the detecting signal for an even greater precision of target location. Light to handle at just 6.5 oz, the Pro Pointer AT has a long battery life of 30 hours so you won’t have to worry about having to recharge while you’re out and about. Even better, as it’s protected by a two-year manufacturer’s warranty you can have complete confidence in your purchase with the knowledge that, should a problem arise within that period, the issue will be quickly rectified. As one helpful extra addition there’s a lost Pro-Pointer alarm helping you to avoid the inconvenience (and embarrassment) of leaving your detector behind. This small detail just goes to show the attention to detail from this quality brand. There aren’t many negatives to bear in mind with this excellent model, however since there’s only a single button to operate all the functions it can be a bit of a steep learning curve to get to grips with how many times it needs to be pressed to activate each function. Bottom Line: In our opinion, the Garrett Pro Pointer AT is an excellent choice for anyone, whether they’re an amateur or pro in the metal detecting arena. It's a waterproof pinpointer, making it perfect for a wide variety of applications while its different sensitivity modes make it easier than you ever imagined to find your target quickly. If you’re looking for great value and good sensitivity, this could be the best pin-pointer for you. Designed to have even better and faster detection of the smallest targets, you can have a lot of flexibility over where you search for your targets. Whether you’re heading to the beach, the woods, your backyard or are even metal detecting inside your home, the Kuman DT-44021 can get the job done in no time. 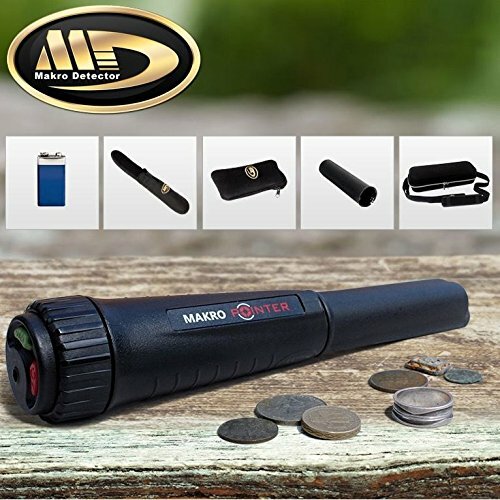 Whether you’re searching for gold, silver, jewellery or coins, the three different sensitivity levels offered by this pin-point metal detector will help improve your accuracy and speed while the LED indicator lights, vibrating and audio alerts leave you in no doubt as to when you’ve reached your goal. The advantage of this is that your device is super-simple to use, even for a complete beginner. Its small size makes it easy to carry around no matter where you’re heading, and its lightweight design means that you can use it for extended periods without any discomfort. With its 360-degree side scanning function and its pinpoint tip detection, you can be certain of better and more accurate results. When it comes to ease of use, the Kuman DT-44021 really excels. It features a single touch operational system for the ultimate in convenience and user-friendliness. Simply press the button and narrow down your field of detection to pinpoint your target precisely – there’s no complex learning curve at all. This great value model is one of the best pinpointer metal detector options for beginners or younger users who are being introduced to the art of metal detecting. Its affordable price tag brings it within easy reach of users on a budget and its effective and simple operation makes it perfect for anyone with limited or even no prior experience, allowing novices to get to grips with the basics before progressing on to a more advanced model if required. If you’re looking for a waterproof metal detecting pinpointer, on the other hand, this might not be the gadget for you. 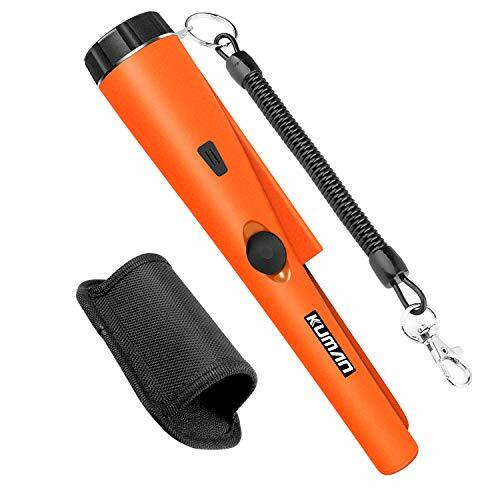 While it is designed to be IP65 water resistant, you may have no difficulties when the weather turns inclement but if you’re keen to try metal detecting in a lake, river or even a deep puddle you won’t be able to use this device effectively. Only the plastic tip is designed to be water resistant, so dipping the higher parts of the device into water will result in damage that can’t be repaired. Not ideal when compared to some of this device’s rivals which are fully waterproof. Bottom Line: If you’re on the lookout for a metal detecting pin-pointer that is perfect for a complete beginner or for a young user, this could be the ideal option for you. Designed for ease of use, this user-friendly device offers three sensitivity modes and can be used on all kinds of terrain from sand to soil. This is a great choice for simple gold prospecting or jewellery hunting jobs. Recommended Reading: Don't miss our list of the most amazing metal detecting finds! The Deteknix could be the best detector pin-pointer if you’re keen to get the biggest bang for your buck. With its guarantee of no false-positives, this gadget has a superior quality LED light, adjustable sensitivity and even comes in a choice of colors to suit your personal tastes meaning that it represents pretty amazing value for money. In fact, if you’re a fan of the Garrett Pro Pointer AT but don’t feel that your budget can stretch so far, the Deteknix could be the solution. It’s packed with most of the same impressive features but at a fraction of the cost. It even looks so like the Pro Pointer that you’ll need to look hard to make sure you’re using a Deteknix! Although it’s made by a Chinese company, that doesn’t mean that you’re getting inferior quality or construction from this device. It’s actually very solidly built and offers excellent functionality. One excellent feature that it boasts is that it will never give a false-positive, even if you’re putting pressure directly onto the tip – something which is highly desirable to all kinds of metal detecting enthusiast. Thanks to this, it’s easier than ever to use while sifting dirt in a hole. With some other models, worries about false-positives can stop you from pressing down hard whereas with the Deteknix you can sift away without any concerns. Another added benefit offered by this gadget is its integrated superior quality LED light. Brighter than that offered on many other similarly priced models, the Deteknix is ideal for metal detecting in dense woodland, at dusk and on cloudier days when visibility is poor. A final nice touch is the choice of colors – gray, camo, orange or black. While that makes no difference to the functionality of the gadget, it can make a big difference to its style. Lightweight at just 4.7 oz, this is an easy device to carry out and use everywhere, it is also protected by a one-year manufacturer’s warranty for your complete peace of mind. So, what are the negative points? There’s only one but it might make a big difference depending on where you’re planning on heading for your metal detecting hobby. If you’re only planning on metal detecting in soil, sand or indoors, you won’t have a problem with this device, but if you want to hunt in puddles, lakes or rivers this is not the device for you since it isn’t waterproof. Bottom Line: Are you looking for an affordable option with most of the functionality of the Garrett Pro Pointer? Then the Deteknix could be perfect for you. Ideal for all types of on land application, it’s easy to use and represents good value with plenty of features that you would expect to see on a more expensive model. The Macro Pointer is packed with features that makes it one of the most all singing, all dancing pin-pointers metal detecting has to offer. Having been on the market in various iterations since 2014, this Turkish-made model has proven to be highly popular thanks to its waterproofing. The first mainstream model to be released onto the market to be fully submersible and waterproof, the popular Macro Pointer has several levels of sensitivity so you can easily adjust it to suit the needs of your application. There are three modes to choose from – audio/vibration, vibration only and audio only, so you can select the one that suits your preferences best. Perhaps the biggest selling point of this device is its two hard shell replaceable cases which come supplied free of charge with your purchase. These cases protect your device and extend the lifespan so you won’t need to worry if you accidentally drop it while out metal detecting. One case is a basic cover however the other features a scraping blade which facilitates sifting through dirt, making your detecting much easier. One further benefit is the inclusive pack of goodies which comes with your purchase. The belt holster which comes supplied allows you to easily carry your device around with you without you having to constantly hold it in your hand. There’s also an inclusive free finds-bag for extra convenience and a carry case with an integrated shoulder strap so you have more options for carrying your equipment round. That’s amazing value for money when compared to many rival models. The battery life is very long 30 hours, so you won’t need to worry about frequent recharges when you’re out and about, and with the two-year warranty you’ll enjoy complete peace of mind in the quality of your purchase knowing you’re well protected. On the downside, this device weighs twice that of some of its rivals at 8.3 oz, although that isn’t exactly a heavy weight. Two further downsides are that there is a relatively steep learning curve when it comes to operating this device. The functions of each button can be difficult to learn. Also, since the device is only waterproofed to a maximum depth of three feet, you’ll need to be careful where you use this pin-pointer – it probably isn’t the best option if you’re planning on ocean surf hunting, although it’ll be absolutely fine for use in muddy puddles. Bottom Line: If you’re looking for great value and a lot of bang for your buck, the Macro Pointer could be ideal for you. Thanks to the waterproofing and two supplied cases, it gives you a lot of flexibility in where and how it can be used, while the many inclusive accessories represent even better value for money. 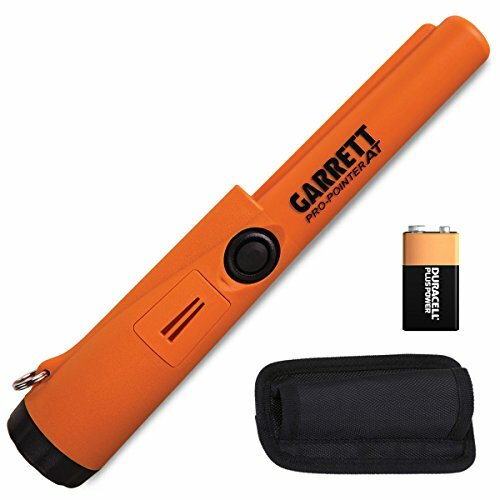 The updated model of the Garrett Pro-Pointer, the Pro-Pointer II is an even better choice for anyone who is serious about their metal detecting hobby. With its revised design and wealth of brand-new features that have been developed thanks to Garrett’s attention to customer feedback, the Pro-Pointer II gives you the high level of performance that you’d expect from such as well-known leading brand. Just like the original Pro-Pointer, this upgraded model features a lost pin-pointer alarm, which will let you know where it’s located if it inadvertently becomes lost while you’re outdoors. It also has an automatic switch-off feature to help save on battery life. The inclusive lanyard attachment clip makes it easy to take your device anywhere you plan to go, so whether you fix the Pro-Pointer II to your detector, digging pouch or belt, you can operate it hands free. Its tough design has been created specially to withstand the harsh outdoor conditions of the field so you won’t need to worry about accidental damage or breakage. Of course, sensitivity is a key feature of any pin-pointer, and you’ve got nothing to worry about with this model. Its increased power means that you can locate your target more rapidly. Meanwhile, the fast off-and-on cycles ensure you can rapidly shrink down your detection field in order to pinpoint a larger target more precisely. You can also effectively tune out wet beach sand and mineralized ground. The 360-degree side scanning function makes it easier to pinpoint your targets and the automatic tuning and pinpoint tip detection makes life much easier. You can also use your gadget in low lighting conditions such as on cloudy days or in the evenings thanks to the integrated LED light. This also makes its use in holes a breeze. The power button has been oversized to make it simple to operate when you’re wearing gloves, while thanks to the long battery life you won’t need to worry about having to recharge out in the field. This pin-pointer is fully waterproof to IP66 standards, so it can be cleaned underwater without any problems. You’ll also receive a belt holster with every purchase to make carrying your device around a breeze. Although it costs a little more than some of its competitors its many benefits make it a great choice for anyone who can afford the initial outlay and who is serious about their hobby. Bottom Line: If you’re searching for a metal detector pin-pointer that is seriously state of the art, the Pro-Pointer II could be ideal for you. Great for anyone who is serious about metal detector, this model offers all the functionality that you need to find even the smallest target. It doesn’t need to be difficult to select the best pin-pointer for you, but it can be very easy to be overwhelmed by all the different options available on the market today. These metal detector pin-pointer reviews are designed to help you to make the right purchasing decision and to get the best possible device to suit your budget and your individual requirements. We’ve weighed up all the pros and cons of the top selling devices on the market and determined a final list of models which represent the best value for money together with the most attractive and relevant features to suit the needs of the widest range of users. Although any of the five options that we’ve recommended here would be a great choice for anyone who is looking for a high-quality pin-pointer, if you’re looking for all round great value for money, we would recommend that you choose the Deteknix pin-pointer. Offering impressive value for money, this gadget offers many of the features of a higher end device but at a fraction of the cost making it ideal for any metal detection fan on a low budget. 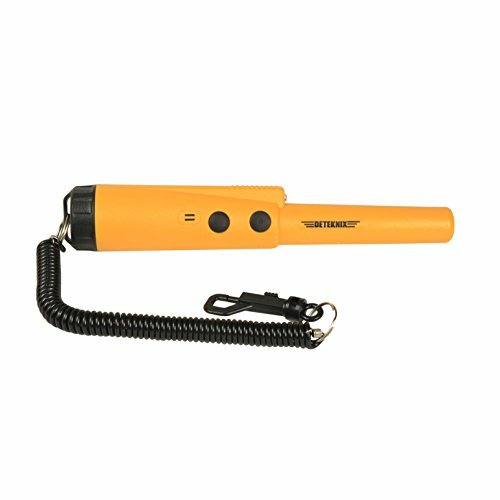 On the other hand, if you plan to do a lot of metal detecting in water, the Macro Pointer could be the best option for you thanks to its superior quality and low price as well as its water resistance to a depth of three feet. Take the time to read the reviews and you’re sure to find it easier than you imagined to find the right metal detector pin-pointer to suit your requirements and to maximize your finds in one fell swoop. Recommended Reading: Check out the finest RF bug detectors in our latest guide. If you’re ready to buy your very first metal detector pin-pointer you could probably benefit from some expert advice about how to make the right decision and what kind of features you need to be looking out for. Simply reading all the Barska metal detector reviews won’t give you a rounded and balanced view of everything on the market, so our buying guide is here to tell you the factors you need to bear in mind before you make your final decision. Perhaps the most relevant factor to keep in mind when choosing the right model for you is how often you’re planning on using it. If you only go out metal detecting on an occasional basis you won’t need to consider longevity and robustness quite as much as someone who uses their detector every day and who would benefit from a device that is designed with durability and solidity in mind. Where will you use your gadget? Almost as important as the frequency of use is the location you’re planning on using your detector in. Metal detectors head off to a host of locations to pursue their hobby, from beaches and woods to rivers and the Gold Country. You’ll ned to make sure that your pin-pointer is suitable for use in the environment in which you plan to be operating. If you’re planning on metal detecting around water, for example, a model with built-on waterproofing and buoyancy is vital if you want to avoid damaging your gadget. Who’s going to be using your detector? There are different types of metal detector pin-pointer that are best suited to different types of user. Some are geared towards professionals, and while they are considerably more expensive, they boast many more features which are essential for those who need the highest possible precision. Some pin-pointers are designed to be simple to use and are perfect for the first-time user or for children who are just getting into the hobby. Keep the user in mind before you buy. There are many features included on some models of pin-pointer and knowing which ones are essential for you is important when choosing the right device to suit your needs. It’s always wise to choose the best possible device that you can afford for your money since it will be equipped with more features that can improve your treasure hunting experience, however some features may be unnecessary and adding extra cost for no reason. Do you need different sensitivity settings? Do you need a super-powerful LED light for sifting through holes? These are factors to consider before making your final choice. Find out how you can make a simple metal detector yourself in our three step guide. Most pin-pointers at all levels come complete with a woven holster which makes carrying your device around with you hands-free a breeze. However, some better value devices come with a host of other accessories and goodies completely free of charge. For example, some come with a carrying bag for easier transportation and storage while some come with a clip which allows you to fix your pin-pointer onto your belt or metal detector for greater convenience. While most pin-pointers share a similar design, there are a few subtle differences which might affect your purchasing decision. One factor that varies between different models is color. Do you want a subtle black device? Or do your want something in a more stylish and attractive eye-catching color? Or perhaps you’re planning on doing a lot of water metal detecting and need something very bright so that it will stand out under the murky water of puddles and rivers? There’s bound to be a model out there which is the right color for you. You’d be surprised by how many times people who are out metal detecting put down their pin-pointer and then forget where it is. You can avoid the embarrassment and inconvenience of leaving your device behind in the wood or on the beach if you choose a gadget which has a lost pin-pointer alarm built in. This will cause the device to beep loudly after a set amount of time so that you can locate it easily without any fuss. It’s fair to say that most frequently you get what you pay for. If you go for a pin-pointer that is at bargain basement price you probably aren’t going to find it the best gadget you’ve ever used. It probably won’t last very long, and you may find that it gives false positive results. Clearly this isn’t the best option. Even if you’re on a low budget you should still look for the best possible device that you can find that fits within your designated budget. That way, you can be sure that you’re getting as high a quality as possible. The very highest end models are probably only suited for professional use, but there are lots of more affordable mid-range models which represent great value without scrimping on features and great construction quality. One final element to consider before you make your decision is the type and length of warranty that the pin-pointer manufacturer is prepared to offer you on their product. You should expect to get at least one-year’s warranty with your purchase, but the best deals will offer you two years of protection to give you the complete peace of mind that you seek that you’ll be well covered in the unlikely event that your product has a defect or develops a fault within that period of time. Before you buy any metal detecting pin-pointer you should take the time to check out product ratings as well as expert and existing user reviews. This way you can get a balanced viewpoint about which are the most highly rated models on the market today. You’ll find out everything you need to know about usability and performance as well as the more advanced features and how much customer support you can expect to receive from the manufacturer should there be a problem in future. Our reviews are designed to make the process of doing the essential research quicker and easier so you can make a speedier final decision based on solid information. Although choosing the best pinpoint metal detector may not be the easiest job in the world, it needn’t be the hardest either. Once you’ve worked out the budget that you can afford and the key features that you absolutely must have, you can start your research to find the best products that meet all your criteria. Our reviews will help to point you in the right direction so that you can pinpoint the right device for you in no time! That's all on pinpoint metal detectors for today. If you have any questions then please get in contact down below. We'll be happy to help. Don't forget to check us out on social media or join our mailing list to stay up to date with all the latest news here at StealthyNinjas.com!